Librarians recognize that the idea of libraries as a place for just books is ludicrous and has been for decades. “We go with the ‘great libraries build great communities’ mantra,” says Nancy Coriaty, deputy town librarian for branch services at Fairfield (Conn.) Public Library. “If we see something we think will benefit the community, we go for it.” It was with that thought in mind that the library created a seed library at its Fairfield Woods branch in 2011. The basic concept of a seed library is fairly simple: Gardeners “check out” seeds to plant in their own gardens, and when the growing season is done, they save seeds from the plants they grew and return them for other gardeners to use next year. In practice, seed libraries adapt this basic concept to the needs and capabilities of their communities. Many libraries have created or hosted seed libraries in the past few years as part of their regular services. 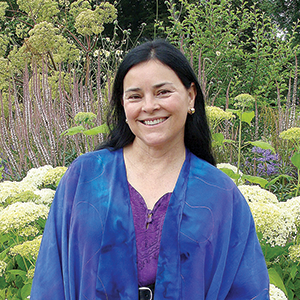 Newburn talked to BASIL, and offered herself as a volunteer with the proviso that her ultimate goal was to learn enough to develop a seed library in nearby Richmond. That goal came to fruition in May 2010. Newburn says Richmond Grows was the seventh seed library in the United States, but that figure has now ballooned to more than 300, with many hosted by libraries. Seed libraries have a strong educational component as well. They attract gardeners of all experience levels, from novices to experts. “Humans have been saving seeds for generations, but in recent times many have forgotten,” says Rebecca Swanger, adult services librarian and volunteer coordinator at the Joseph T. Simpson Public Library, a member of the Cumberland County (Pa.) Library System, and head of the Simpson Seed Library. A tomato-tasting program proved to be a favorite community event at the Fairfield Woods seed library, bringing together about 45 people to see, taste, and discuss the different tomato varieties. At Hall Middle School in Larkspur, California, a group of 6th-graders established a seed library within the school library that directly supports the school’s 6th-grade science curriculum as a science project three years ago, says District Librarian Carol Halpern. Students learn about habitats and ecosystems in the school’s Food Forest, a garden designed to replicate natural ecosystems. “The seed library lets kids think about creating a habitat at home, so it’s a logical extension,” Halpern says. Libraries are perfectly positioned to provide the information necessary to support gardeners in their efforts. At the Benson branch, for example, the library offers a display of gardening books near the seeds. 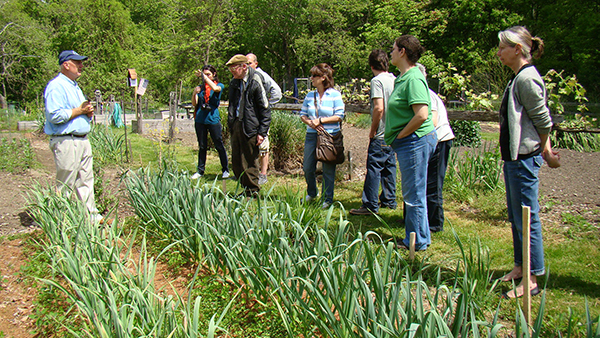 It also provides an array of library programming, including classes on seed saving; starting seeds indoors; planning gardens to prevent cross-pollination (which can produce hybrids not suitable for seed saving); learning about companion plants, composting, and pest control; preparing soil for planting; and winterizing a garden to prepare the soil for spring. With hundreds of seed libraries operating in the United States, libraries that are interested in offering seeds should first know that they’re not alone. “You don’t have to reinvent the wheel,” Swanger says. She recommends the Richmond Grows website for its information on seed swaps, guidelines, and general operation of a seed library. Common Soil’s website also offers a host of resources, as does seedlibraries.net. Overall costs for a seed library are fairly small. Common Soil spent about $2,000 in 2013, including stipends for program presenters and the costs of seeds, envelopes, and labels and barcodes. Costs grew to $2,500 in 2014, because of the library’s preparations to open seed libraries at two new branches. There are several practical considerations and decisions to make when getting started. Perhaps most visible is where the seed library will be stored. In an elegant bit of reuse, the Simpson Seed Library is housed in an old card catalog donated by a retired librarian. Omaha Public Library also plans to use card catalogs for seed storage when it adds seed libraries at two more branches this year. 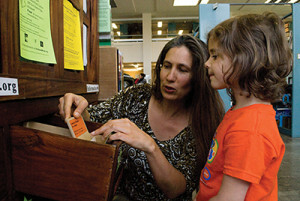 Many libraries have acquired seeds through donations. In Fairfield, for example, the local Comstock, Ferre & Co. has given the library 500 seed packets a year. But there is a decidedly local art to selecting seeds that are likely to work well in a seed library’s community. The Common Soil Seed Library in Nebraska organizes its seeds by how difficult they are to save: Green ones are easiest, while the red ones are recommended for experienced seed savers. “Most seed companies will typically sell what sells widely—seeds that can grow in a wide range of climates,” Newburn says. “Seed libraries can be more community focused.” That means that seed libraries can play a role in protecting a community’s food heritage by protecting local heirloom varieties—those unique varieties that may not succeed everywhere but that are well adapted to a community’s local climate. Such heirloom varieties might require special policies. “A neighbor gave me a seed for Great, Great Aunt Rosie’s Italian pole bean, which has been in his family for decades,” Newburn says. “I don’t know of anyone who’s growing an heirloom bean like that, so we put in a real effort to save it.” When Richmond Grows gets local heirloom varieties like that, it reserves them for a special grow-out program that will allow only experienced gardeners to raise the plants and build up a population of seeds. Eventually, the library has enough to start lending, but it continues to steward those varieties to ensure they are available in the future. Even more common seeds may not be appropriate for all gardeners. Some plants are more difficult to grow than others, requiring certain growing conditions, maintenance, or pest control. For example, Newburn says, peas and beans will usually self-pollinate before their flowers open, making it easy to save their seeds. Corn, on the other hand, requires a large population and hand-pollination to produce seeds that can be saved, which is generally impractical for a home gardener in an urban environment. 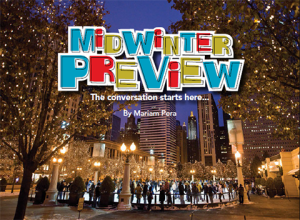 Halpern also says that students often need guidance about what seeds to grow, and when. Being in California, the school’s community has a longer growing season than many other states, but there are still limits. 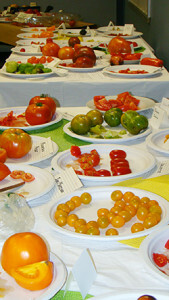 Tomatoes are popular, for example, but even in California they need to be planted in the spring. “Some kids do want instant gratification and need to be persuaded of what will work,” Halpern says. 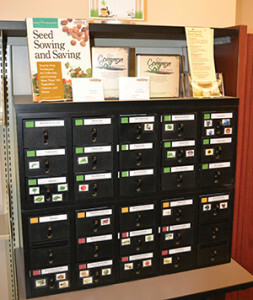 The library offers information about every seed’s needs and optimum planting and growing times. There’s a significant variety in checkout policies among seed libraries. Richmond Grows, for example, is highly informal. It operates on an honor system, with no library card needed. “We encourage people to take just what they need,” Newburn says. 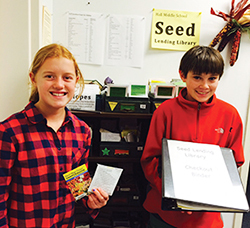 Annika and Jack, 7th graders at Hall Middle School in Larkspur, California, show off the school’s seed lending library. In Omaha, on the other hand, seeds are cataloged. “Every envelope has a barcode, because we wanted them to be deliverable” to each of the system’s 12 branches, Steiner says. Patrons can request seeds at any branch and have them delivered to their local branch just like a book or any other library material. The catalog automatically “checks in” the seeds the first day of each month and weeds them so they can’t be checked out again. “Many of our patrons are new gardeners who don’t yet have the level of confidence where they think they can bring seeds back,” says Fairfield’s Coriaty. She says that about 15–20 of the more than 100 gardeners who checked seeds out last year returned some. Libraries don’t necessarily need gardening expertise on staff to successfully build and operate a seed library. Many seed libraries tap into active local gardening communities to provide classes and background information. In Fairfield, for example, local master gardener Tovah Martin presented the seed library’s kickoff program. Another master gardener, library volunteer Eric Frisk, has offered several hands-on programs in the library’s community garden plot. Meanwhile, Coriaty has worked to build connections with related organizations to help spread the word about the seed library, including the Fairfield Organic Teaching Farm, the Fairfield Earth Day committee, and the local Grange. The seed library has helped to build the local gardening community while strengthening other library relationships as well. For example, Coriaty works with a local senior center to offer a monthly book club. The director there received a grant to install a free-standing raised-bed garden that seniors could work at without having to bend over, and now the library provides seeds for that garden. These connections can be a powerful promotional tool for seed libraries. “Gardeners are passionate about what they do, so when we told them about the seed library, they really spread the word,” Swanger says. This led to the Simpson Seed Library being featured in local newspaper columns and TV shows—although this may have been a mixed blessing, as it attracted the attention of the state Department of Agriculture (see sidebar). In Omaha, the library talks to the leaders of local gardening groups, as well as farmers at the local farmer’s market and school teachers who visit the library. Next year, the library plans to reach out to the city’s refugee population. The rise of seed libraries has been accompanied by plenty of enthusiasm from librarians and patrons. Cumberland County (Pa.) Library System’s Simpson Seed Library also attracted a whirlwind of controversy and misinformation last year after receiving a letter from the Pennsylvania Department of Agriculture (DOA), warning that the seed library might not comply with state law. “Our concern is truth in labeling and consumer protection” to ensure that the seeds that are distributed are what they are portrayed as and viable to germinate, says Johnny Zook, seed program supervisor at the Pennsylvania Department of Agriculture. As state laws vary, however, the situation may play out differently elsewhere. Duluth (Minn.) Public Library’s seed library was recently visited by the state over perceived violations of the state seed law’s requirements for labeling, germination testing, and permitting. The library is working with the state’s DOA to attempt to meet the law’s requirements. One might argue that this type of state regulation shouldn’t apply to the small scale on which seed libraries operate. Rebecca Newburn of the Richmond Grows library offers alerts about legal matters that librarians can sign up for at seedlibraries.net. She says the seed libraries movement is concerned with some state departments of agriculture interpretations of seed laws, and it plans to work to protect the right to save and share local seeds and, where necessary, to work to change the laws. For more information or to get involved, email Newburn at seedlibraries@gmail.com. —G. L.
GREG LANDGRAF is a freelance writer based in Chicago.